Hitachi announced a world first at its IFA 2007 keynote this morning, with two new Blu-ray camcorders, both of which offer 1080i movie shooting - something Hitachi refers to, slightly misleadingly, as Full HD. The camcorders do, however, shoot images at 1920 x 1080 resolution. Hitachi said that some of its camcorder rivals offered lower resolutions even though they also promised HD video. The DZ-BD70HE and DZ-BD7HE models can shoot up to one hour of HD video on 8cm 7.5GB Blu-ray discs. The BDP-S7E also includes a hard disk drive enabling you to shoot up to four more hours of HD footage. 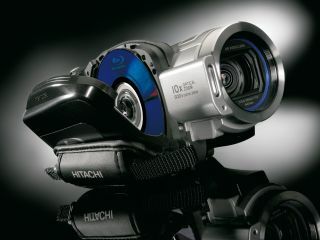 Both camcorders feature Hitachi's proprietary Full HD Picture Master processor which delivers smooth motion images. They also include 5.3-megapixel CMOS image sensors, the highest resolution for any CMOS sensor in a camcorder, Hitachi says. The camcorders have the ability to record to standard definition rewritable DVDs, including DVD-RAM, DVD-RW, DVD-R, DVD+RW. They can also shoot video on to SD flash memory cards. Both will be available in October, with the hybrid HDD / Blu-ray model -DZ-BD7HE - selling for around £1,000. The price of the cheaper version is not yet known. The Blu-ray cams are the latest in a long-line of camcorder innovations from Hitachi, starting with the world's first hard drive MPEG4 camcorder in 1997 and culminating in the world's first DVD / hard drive model last year.